Yippee-ki-yay! (If you know the rest, you may be part of the audience for whom this R-rated action-packed demolition derby was made...smile...) He's baaaack.... John McClane is our favorite Energizer Bunny. 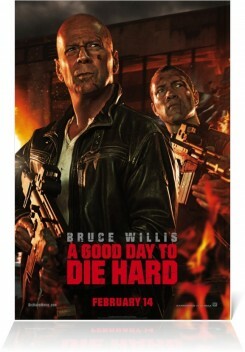 Bruce Willis's dependable "Die Hard" action franchise (1988, 1990, 1995, 2007) continues to print money, so why not? This time Mr. McC. is off to Russia because his grown son seems to be off the grid, and his daughter asks him to find him and bring him home. This prompts an unending series of vehicular smashes, gunfire, rocket fire, helicopter crashes, fist fights, suicidal leaps off roofs and down fire escapes, plus other violent action that I have forgotten. I have NEVER seen so many thugs shot, vehicles smashed and interiors destroyed. Bruce Willis ("Looper") is John, he tries in vain to speak Russian but the cabbie just laughs at him and treats him to a Frank Sinatra song. Jai Courtney ("Jack Reacher") is Jack, who seems to be in a tight spot, but does NOT want Dad to get involved. Mary Elizabeth Winstead ("Live Free or Die Hard") is Lucy, she doesn't know who she should worry most about, her dad or her brother. Sebastian Koch ("The Lives of Others") is Komorov, a former gangster worth the price of your ticket. Yuliya Snigir ("Kokoko") is Irina, the gangster's resourceful daughter. Blazing guns, fast cars, skidding semi trucks, non-stop action, blowie uppie stuff...you know the drill: Suspend disbelief, watch for five minutes, lather, rinse and repeat.